When we are stuck in a challenging transition in our health, relationships, or work, we can feel exhausted, overwhelmed or lost. In Evolving Soulfully, Dave Waugh draws from wholistic psychotherapy and interspiritual wisdom to help us clear barriers on our path. 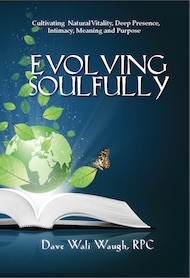 In this book he offers a map, a compass and guidance toward cultivating a soulful life of natural vitality, deep presence, intimacy, meaning and purpose. For many years, I have made it a practice on Remembrance Day to dig for Inner Treasure. I begin by reflecting on the past so that I can harvest the experience and lessons of my life. This time of reflection allows me to understand more deeply all that I've learned and to make the issues that are arising in the present more visible. With this mirroring I am better able to work with whatever emerging and longstanding challenges are present, and to treat them as invitations to continue to heal, transform and evolve soulfully.